We need a deposit of 50% of the total cost of the reservation, within one week of when the reservation has been made. 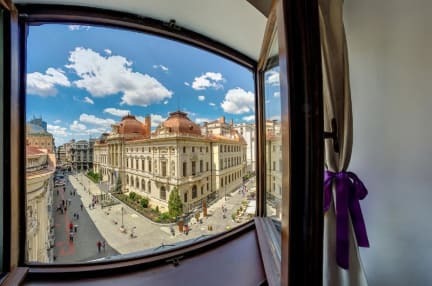 Having the best location possible - it is the only hostel located in the pedestrian old town city center, Little Bucharest has been designed especially for backpackers and young travelers. For active, vibrant people who want to be part of the action-packed downtown area. at the moment, they still enjoy the environment of a hostel and meeting new people here, in Romania. And only for Hostelworld guests, we offer free towels on accommodation. We trust that the modern classy feel, welcoming atmosphere and excellent location of Little Bucharest Hostel will provide you with a home-like, cozy base for your stay in the city. Come get your affordable drinks at our bar in the lounge area before stepping out in the old town of Bucharest. The lounge is a really bohemian place, with a beautiful view. You should definitely check it out! Great location - only stayed one night here, arrived late and left early, but ticked all the boxes. Word of warning: the rather aptly named Whispers nightclub nearby blares music through the night. Not the hostel's fault, but be wary. Bathrooms could be cleaner. Also, the lift doesn't work, so take that into consideration if you have got heavy luggage. My friend and I stayed here for three nights in June and we were both very satisfied on the whole with the hostel. The location was central in the old town, great value for money and the beds were very comfortable. The staff were also friendly and the hostel was clean. The only problems we had was the hostel needed a little attention regarding security and bathroom facilities (some of which were out of use) and it was noisy due to bars and clubs, but earplugs are provided which was appreciated. Perfect location, but half of showers are broken, only 2 work for 20 people ! There were people partying until 4:30 am, sleeping was impossible. Cleanliness was at the low level. Security non existent. Main doors never locked,no lockers in room, room door lock useless. Location amazing right in centre with nice view from room window. Don't pick here if you like quiet place. Staff were sometimes helpful sometimes useless. Waiting staff at the bar kept change without asking. No nice hostel atmosphere in the hostel. Rooms were clean, toilets and showers stank of piss. Quite expensive given the standard of accommodation,the bar is the most expensive in the city.